Our Corner Floating Glass Shelving is the best glass shelving solution for a trimless shelving solution. Using tempered glass, the floating effect enhances the displayed product to help grab the viewers’ attention. They act as durable shelving solution, optimizing corner space that is being wasted. 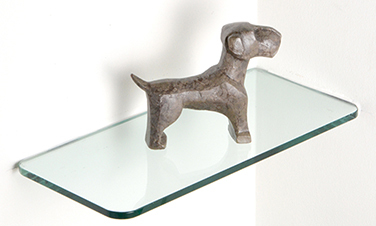 The versatile design of our glass shelving can be used in any design setting; modern, antique, mid-century and more. Our glass shelves can be used in different spaces. Some applications include bathroom, showers, display cases, offices, restaurants, closets, kitchens, bars and more! The possibilities of our frameless glass corner shelves are endless. Glass shelves can be installed into concrete, wood, stone, drywall and in-between wall tiles. Our patented tongue-and-groove™ system is lauded by architects, designers, and homeowners alike for its design, and ability to sustain weight, all while achieving a completely seamless look. Our wide selection of corner glass shelves allows you to create virtually any shelving solutions without boundaries. Shop for our Floating Corner Shelves by shapes below. 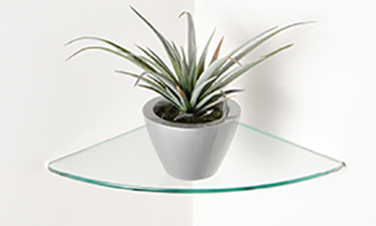 Illusion: Tempered glass corner shelves have been sought out by retail store designers. The illusion of a floating glass shelf allows for instant focus on displayed items, grabbing the viewers eye. Minimal distraction and no bulky clips need! You can also find glass shelves in museums and galleries displaying historical artifacts and collectibles. Patented tongue-and-groove™: Install yourself in just minutes with our unparalleled installation system. Our patented tongue-and-groove™ system has the ability to sustain weight, all while achieving a completely trimless look. To learn more about our tongue-and-groove™ system, visit our Installation Page or view our Installation Video below. Versatility: Our corner glass shelves can be added to any design setting: modern, Mediterranean, classic, and more! The frameless look allows for endless possibilities! Optimization: Utilize wasted corner space by adding our floating glass shelves. Add more storage and display space for any desired setting. Floating Glass shelves can be found in a number of different locations. Below you can see different inspirations as to where our corner shelves have been used. The shower is a popular location to place a floating corner shelf. Our waterproof glass shelves is a great place to place all toiletries. It's a great storage space for all your shower needs. An office uses our glass shelves to display achievements and business certifications. The minimal look of a glass shelf matches a work like environment,eliminating bulky shelving and eyesore hardware. Kitchen storage is essential in every home. Any desired cookware can be placed on a glass shelf. It can be used both in a pantry room or as a creative display in any kitchen. What's your favorite glass shelving location?